Building a farmhouse table is a fairly straightforward project that even a beginner can handle. These plans include cut lists, material lists, diagrams, photos, and written instructions so you can tackle the project and come out with a great looking handmade table at the end. These farmhouse table plans are all a little bit different so be sure to look through them all. They come in a variety of sizes and they all have details that you can add to make them uniquely yours. 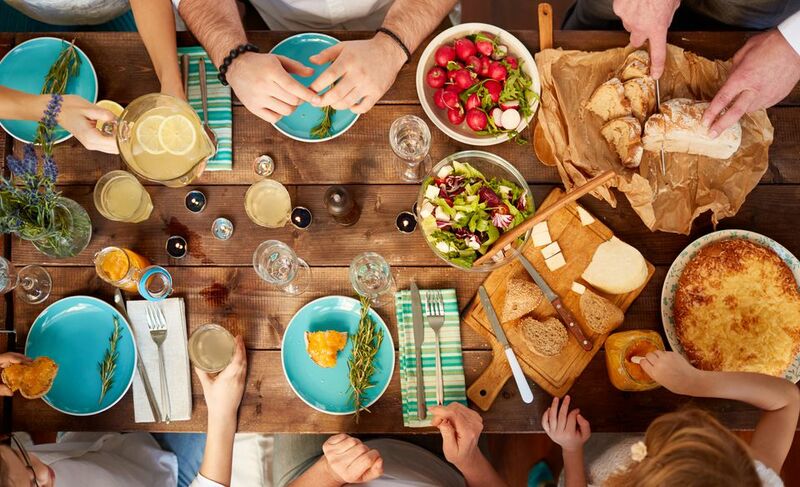 If a farmhouse table isn't exactly what you are after maybe a dining room table that's more on the contemporary side will pique your interest. If you like these free woodworking plans, you may also like ones for building a kitchen island, home bar, ​or coffee table. This particular farmhouse table from Decor and the Dog ends up standing 29 inches off the ground, is 96 inches long, and will be 42 inches wide when completed. The instructions for this farmhouse table are easy to follow because the plan shows up close illustrations and dimensions alongside the steps, neither of which are difficult to understand. The cut list and list of materials are also included in the plan. At the very bottom of this page at Decor and the Dog are related links like how to finish the farmhouse table, and how to paint the chairs you see in this picture. This free farmhouse table plan features X braces on either side and a small industrial touch with a metal pipe reaching across the bottom of the table. The free plan includes step-by-step how-to instructions, a tool list, a materials list, parts and cuts list, and some extra tips. 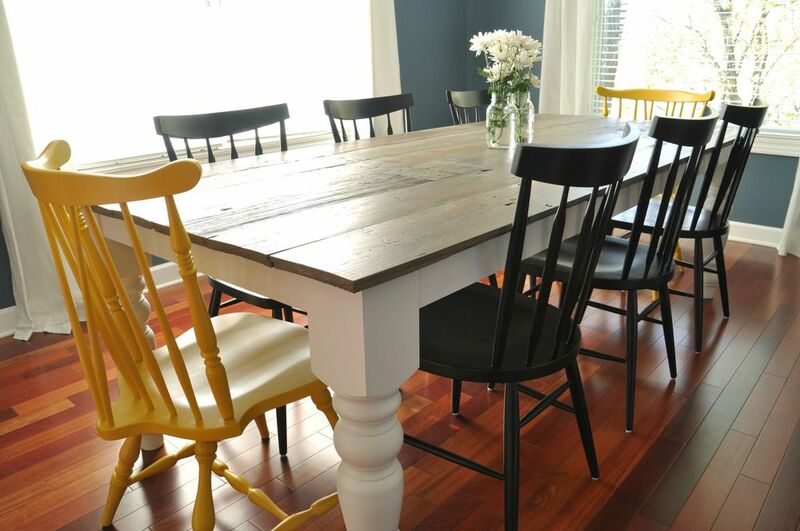 Here's a beautiful DIY farmhouse table that features a stunning table along with two benches. It's inspired by a Pottery Barn farmhouse table but only costs $100 to build. A PDF of the free plans includes diagrams, a cut list, a materials list, and building directions. Ana White has done a great job putting together this plan for a farmhouse table. It's easy to follow because the instructions and illustrations are very easy to read. This table is 85 inches long and 30 inches high off the ground. In this plan are not only the instructions but also a full list of items you need to have to complete it, including the required tools. This is another free farmhouse table plan from Ana White but doesn't look as "nice" as the one from above. This table is 72 inches long and sits 30 inches off the ground. In addition to the shopping list, tools list, and instructions through the link above ​are a printer-friendly version and a PDF you can download. Here's another free farmhouse table plan, this one from DIY Projects with Pete. I like this plan because not only are there lots of pictures and notes, but an instructional video is also available. The table top for this particular table is 87 inches long and 46 inches wide. This plan also links to more information on building the matching benches. This farmhouse table from HGTV is 96 inches long, 38 inches wide, and stands 30 inches off the floor. The step-by-step instructions include illustrations that are easy to read and understand, and all the materials you'll need are listed out for you, including the different cuts you'll need to make for the pieces. Instructables has this free farmhouse table plan available that shows you how to build the table in 5 steps. The plan starts off with explaining how to make the legs of the table and goes on to describe the base, tabletop, and finish. Real pictures are included with the steps. This farmhouse table is 72 inches long by 34 inches wide. Here is another free farmhouse table plan that comes from Popular Mechanics. There aren't as many images in this plan as you'll see in the most of the others in this list, but there are lots of written instructions. Like most of these plans, a list of materials is shown before you start so you know exactly how many pieces of each item you'll need before beginning. If you have $300 to spare for a DIY 10-seater modern farmhouse table with a bench, then this is the woodworking plan for you. Check out the link below for more pictures and to find the list of supplies and tools that you'll need to build your own farmhouse table. Everything you see there is required to build the table and both benches. The plans use real images to make it easy to follow along with. So start with the tabletop and then move along with the steps to build the whole table yourself. Tommy & Ellie have this free farmhouse table plan available that's for a 96x41 farmhouse table, but the cut list for a smaller 72x41 table is also available. Like most of the plans from this list, all the necessary materials that you'll need to build the table are listed in the plan. This plan also includes drawings of the pieces and their dimensions, along with written instructions and real images of the construction process. Domesticated Engineer has this free plan that shows how you can build a farmhouse table for around $200. There are lots of images and written instructions in this plan. The first set is for constructing the table, and the second part talks about finishing the table. Before either set of instructions start, you can see all the materials, tools, and ​woodcuts you need, as well as an estimated cost for each material. Handmade Haven has a great DIY farmhouse table plan that's the perfect cross between rustic, modern, and contemporary. The free plan includes diagrams, building instructions, a materials list, a cut list, and color photos to help you build it.